Did you see the Movie WITNESS? This movie was Australian Director Peter Weirs stunning US debut! A young Amish Boy traveling from his father's funeral witnesses a murder in a Philadelphia bus station. This is an artfully crafted drama, richly focusing on the often misunderstood Amish lifestyle, set on a farm in an Amish religious community whose inhabitants lives had changed little from those of the Pilgrim Fathers. 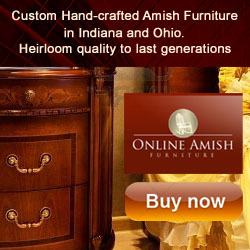 Handcrafted Amish Toys and Games.